McDonald's occupies an ideal space in Stevenage Leisure Park situated on Kings Way, approximately 0.56 miles south-west of the centre of Stevenage (by Stevenage Station). This restaurant is beneficial for the people of Bedwell, Pin Green, Shephall, Old Town, Fishers Green, Roebuck, Stevenage Town Centre and Symonds Green. Doors are open here today (Thursday) from 6:00 am - 3:00 am, for those who would like to visit. Here you will find some information about McDonald's Stevenage Leisure Park, including the hours of opening, restaurant address and product ranges. McDonald's occupies an ideal space right near the crossroads of A602 and Danesgate, in Stevenage, Hertfordshire, at Stevenage Leisure Park. This restaurant is situated within a 1 minute trip from Norton Green Road, Argyle Way, Six Hills Roundabout and Gunnels Wood Road Roundabout; a 3 minute drive from Six Hills Way, St George's Way and A1 (M); or a 10 minute drive time from Broadhall Way and Junction 7 (Langley Sidings) of A1 (M). Please use the postcode SG1 2UA in your Satellite Navigation systems (GPS). Buses drop off at Argyle Way, Bowman Trading Estate, Stevenage Railway Station and Bus Station. The following routes will bring you here: 2, 3, 80, Sb1 and Sb7. Customers can travel by train to Stevenage Station (590 ft) and Knebworth Station (2.73 mi away). The Govia Thameslink Railway line is available. In walking distance, you'll find Airbus Defence & Space, King George V Playing Field, Airbus Defence And Space Car Park, Aeroflex Commercial, Arlington Business Park and Westgate Shopping Centre. With this restaurant, McDonald's has 3 different branches in Stevenage, Hertfordshire. 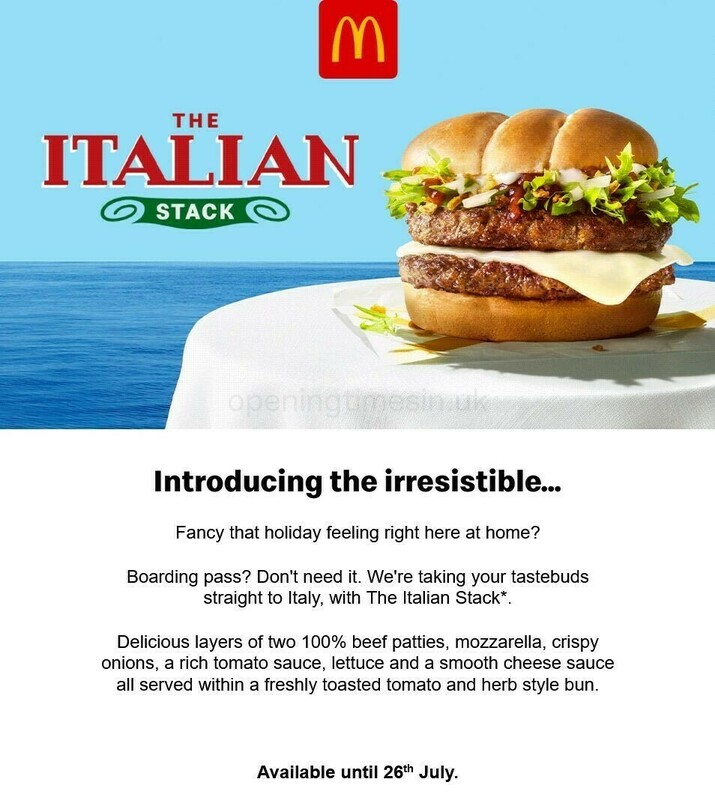 For the entire list of all McDonald's restaurants near Stevenage, refer here. Please note: standard open hours for McDonald's in Stevenage Leisure Park may be restricted during the holiday season. In 2019 these revisions include Christmas, Boxing Day, Good Friday or August Bank Holiday. Take a look at the official site when planning your trip to McDonald's Stevenage Leisure Park, or phone the information line at 370 524 4622 for more details about the seasonal hours of business. Visit Stevenage Leisure Park today for additional appealing stores and great offers. We work to deliver you with the latest information as possible. If you find mistakes in the location details or hours of operation for McDonald's in Stevenage Leisure Park, please let us know by making use of the report a problem form. Your feedback is valued. Please critique McDonald's in the box provided below, and use the star rating system to rate this location.